The nearly 3,500 ads on Facebook and Instagram of the Russian plot have been re-published this Thursday. The Democrats had already delivered a sample last year, but now they took the initiative again and made public everything that Facebook officials presented to the panel in September. The goal of the plot was clear: to place Trump at the White House. The Special prosecutor for the Russian plot, Robert Mueller, accused 13 citizens and three Russian entities in February of having launched an "information war" against the US presidential elections of November 2016. The Democrats pointed out that the announcements published on Facebook and Instagram between 2015 and 2017 had a different consequence in each case: from hundreds of views to more than one million. According to the social network, the scope of the publications was 146 million users. The political announcements were almost all against the Democratic candidate Hillary Clinton. In a page called "Army of Jesus", which had as profile image Jesus fighting Satan, read: "Hillary is Satan, and her crimes and lies show her evil." Against Trump, an event was circulated to demonstrate against the war in Syria, whose photo was the Trump Tower. The call said: "Some believed that Trump would withdraw the US from useless and bloody military campaigns. But what we see only increases the hostility. " 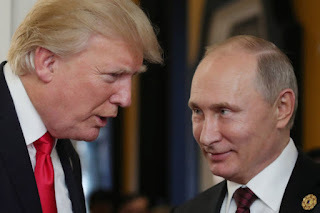 The case file prepared by the CIA, the FBI and the NSA offered a frightening conclusion about the influence of the messages: "Vladimir Putin ordered a campaign in 2016 against the US presidential election. The goal was to undermine public faith in the democratic process, denigrate Secretary Clinton and damage her eligibility and potential presidency. Putin and the Russian government developed a clear preference for Trump." The propaganda financed by the Russian Internet Research Agency (IRA) has been disclosed at the request of the Democrats of the Intelligence Committee of the House of Representatives to clarify the extent of Moscow's manipulation during the 2016 US election campaign. Most ads are incendiary messages on sensitive topics, such as racial divisions, immigration, LGBT issues and gun rights. Until September of last year, when Facebook identified 470 accounts that bought around 3,500 ads for $ 150,000 over a two-year period, Mark Zuckerberg's company repeatedly denied that Russian cyber-activists exploited his platform. However, he ended up detecting that a company, which operated as a kind of troll farm supporting the Kremlin, was paying the advertisements to influence the US policy. The Democratic Intelligence Committee had already published a sample of the ads last year, but now they released all the material that Facebook officials delivered to the panel in September. Since then, the California-based company says it has taken a "much more aggressive" stance on ads about political issues, forcing buyers to verify their identity, location and publicly reveal who they are. Too late, perhaps? What we all know is that no matter the original intentions, the US 2016 elections were “penetrated” and the country as well as the world is maybe in the most uncertain time in history.